Parts of the Midwest are greeting Spring underwater this year. This is due to record rainfall over large areas of unmelted snow, particularly in the floodplains of the Missippi and Missouri rivers. As the rains fell, major and local rivers began to flood their banks and spill into neighboring farmland, towns, cities. Hundreds of families were forced to flee their homes and land as waters rose around them. 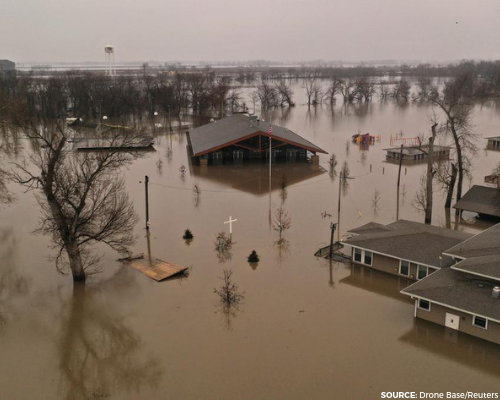 Experts warn that floodwaters may continue to rise as snow continues to melt and more rain may fall. The full effects of these devastating floods will not be known for some time, and many farmers in the region fear what the flooding will mean for the future of their livelihoods. You can help the individuals and families affected by these floods access food, shelter, and other assistance by supporting one of these highly-rated charities today. These organizations receive one of Charity Navigator’s top ratings and have confirmed they are working on the ground to deliver aid and relief in communities affected by these floods.